Exercise balls are a versatile workout tool which can be used in and outside of the gym; they are useful tools for core strengthening and to assist with balance exercises such as pelvic thrusts. The swiss ball can be difficult for beginners because it creates an unstable surface and forces you to use your muscles differently to maintain your balance and posture. The best way to use an exercise ball as a beginner is to practise simple exercises. 1 What Size of Exercise Ball do I need? 2 How much weight can an exercise ball take? 3 How do I get started with my exercise ball? 4 What exercises can I do with an exercise ball? 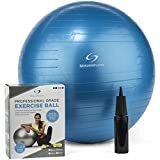 What Size of Exercise Ball do I need? How much weight can an exercise ball take? The weight limit for most stability balls is 250 lbs (approx. 113 kg) although models capable of supporting weights of up to 300 lbs (approx 136kg) are not uncommon. These products are sufficient for basic aerobic and light weight training workouts. ‘Static Weight’ refers to the total amount of weight the ball is capable of supporting, assuming no movement from the user. ‘Body Weight’ refers to how much weight the ball can support when the user is exercising without exceeding the limits of the balls burst resistance. What are Anti-Burst Gym Balls? When choosing your exercise ball you need to be aware if you’re purchasing an anti-burst exercise ball or not. Anti-burst exercise balls will gently deflate if punctured which make them a much safer version of exercise ball. 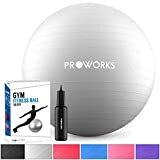 Most gym balls are marketed as an anti-burst gym ball so that when you’re sat on the ball or working out on the ball it’s not going to pop underneath you like a balloon! While larger stability balls are often capable of supporting greater weight, it is important that the balls’ dimensions remain a good fit for your frame. To choose the right size for you refer to the size guide above. 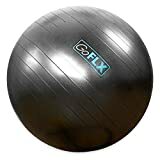 How do I get started with my exercise ball? You should be able to sit on the ball with both feet flat on the floor and your knees should be bent at a 90 degree angle. You should be in an open area and have plenty of space to move around. All sharp and heavy objects should be removed to minimise the potential for accidents. Place the towels around the base of the ball to prevent it from rolling too much. When you get used to balancing on the ball, remove the towels. If you have a workout partner get them to hold the ball for you until you get the hang of the balance and the exercise. You may find yourself holding your breath as you try to balance – breathe normally during the exercise. What exercises can I do with an exercise ball? For more information on how to get the most out of your exercise ball we recommend this article by fitness magazine featuring photos and videos to help you learn. If you have back problems, osteoporosis or any health concern, talk to your doctor before doing any core-strengthening exercises.